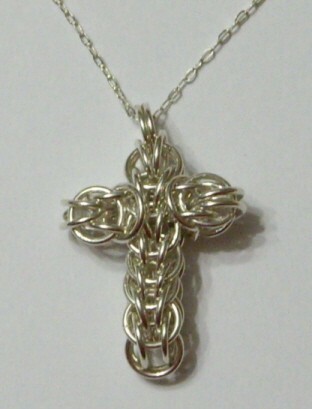 The Full Persian Cross Pendant is a striking piece of jewelry. It is a wonderful symbol of your faith. A Head pin with a crystal on the head can be placed through the cross piece and wrapped around a ring on the back. This can add some color and sparkle to the piece. There are matching earrings in the earring kit section of the website. They are a size smaller than the pendant. The necklace chain is not included in the kit. This is an intermediate weave.